Defeat the meat temptation this Labor Day. That's the message from the Center for Biological Diversity's new hotline, which goes live today to save people from a near-meat experience over the holiday weekend that would be bad news for the planet. Americans eat more meat over Labor Day weekend than almost any other time of the year. In fact, we eat 818 hot dogs per second between Memorial Day and Labor Day. That's a lot of hot dogs, especially when you consider the high cost of meat production to the climate, water, land and wildlife. 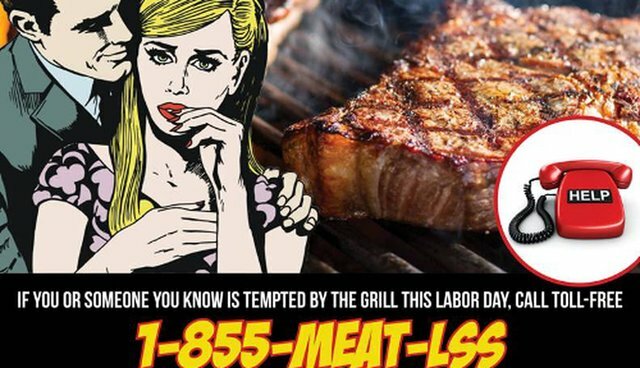 Just in time for one of the top three meatiest cookout weekends of the year, the Center for Biological Diversity is launching the "Defeat the Meat Hotline" (1-855-MEATLSS), a toll-free service urging callers to think about endangered species and the climate before biting into a burger or hot dog this Labor Day. The hotline is the latest project from the Center's Take Extinction Off Your Plate campaign, which highlights the environmental devastation caused by the meat industry and urges people to eat less meat to reduce their environmental footprint. The hotline features four options: "Press 1 if you can't stop thinking about that burger; press 2 if you already have a hot dog in your hand; press 3 if the smell of a BBQ is driving you wild; and press 4 if you've got 99 problems but grilled meat ain't one." Callers get tasty, species-saving information and tips to beat the temptation of meat and help save endangered wildlife. "If you're worried about the climate and the environment, but don't know if you can resist the temptation of all that barbecued meat, the Defeat the Meat crisis team is here to help," said Jennifer Molidor, senior food campaigner for the Center's Population and Sustainability program. The "Defeat the Meat Hotline" - which directs callers to the Center's Take Extinction Off Your Plate campaign - is the Center's latest effort to raise awareness about the plight of endangered species facing habitat loss, pollution, global warming and other effects of meat production by showing that reducing meat consumption is an effective, easy and fun way to help the planet. The Take Extinction Off Your Plate website features menus and tips for an "extinction-free bbq" and a pledge to eat less meat for the environment. "When you fire up the grill this weekend, remember that the meat industry wreaks more havoc on our planet than any other industry," said Molidor. "So what better time to defeat the meat and take extinction off your plate than Labor Day weekend?" More than 20,000 people have already signed the "Earth-friendly Diet Pledge" to reduce their meat consumption by one-third or more. The Center launched its Take Extinction Off Your Plate campaign in 2014 as part of its innovative Population and Sustainability program, which addresses the connections between human population growth and overconsumption and the resulting wildlife extinction crisis. Learn more about the campaign at http://www.takeextinctionoffyourplate.com/hotline.html. You can also follow the campaign on social media using the #ExtinctionFreeBBQ and #DefeatTheMeat hashtags. The Defeat the Meat hotline is the latest addition to the Center for Biological Diversity's Take Extinction Off Your Plate campaign, which highlights the impact of meat production on wildlife and the planet and encourages people to reduce their meat consumption as a critical part of reducing their environmental footprint – and there's no better time to start than one of the biggest meat eating days of the year.